November 19, 2013 , Auburn Hills, Mich. - When John and Horace Dodge developed America's first mass-produced all-steel-bodied cars in 1914, the brothers set a new record for the most first-model-year automobiles ever produced (45,033 cars). One-hundred years later, the Dodge Brother's legacy is thriving as Dodge has become America's youngest and fastest-growing brand – powered by the performance of the legendary Charger and Challenger, the new Durango, the ultimate "no compromise SUV," the world-class new Dart, the ever-versatile Grand Caravan, America's best-selling minivan, and the innovation, ingenuity and efficiency of Journey and Avenger. Now, to celebrate 100 years of Dodge performance and heritage, the brand is offering special editions of two of its most iconic vehicles. New 2014 Dodge Charger and Challenger 100th Anniversary Editions will arrive at dealerships in the first quarter of 2014 with world-class power and performance, innovative technology features and bold muscle-car styling with commemorative design details inspired by the brand's heritage. "The Dodge Charger and Challenger are the perfect foundation to celebrate 100 years of Dodge style and performance," said Tim Kuniskis, President and CEO — Dodge Brand. "Over the last century, the Dodge brand has seen its biggest success when we've combined head-turning designs with ingenious engineering and world-class performance. These two iconic muscle cars do all of that and more. They represent the Dodge brand's heart and soul." Both of these limited production vehicles will share several unique visual elements, both outside and in, including exclusive availability of a new "High Octane" red pearl coat paint, all-new 20-inch aluminum wheels, commemorative badging, unique key fob and a special limited-edition owner's kit and a commemorative book that celebrates 100 years of Dodge heritage. 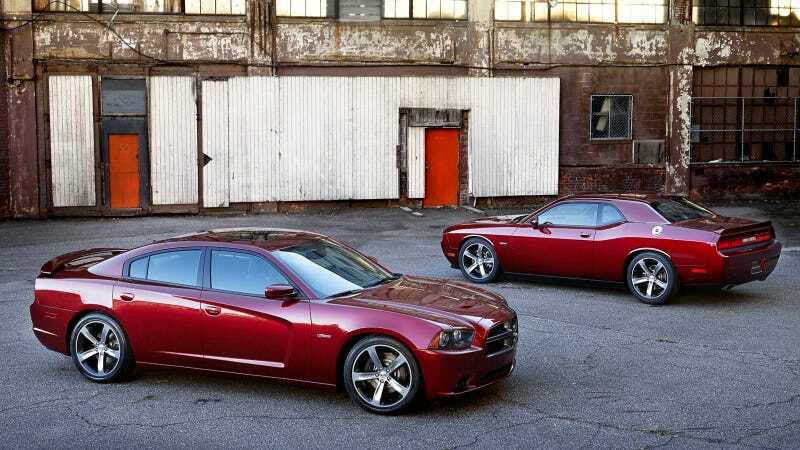 With the Charger, Dodge delivers the world's only four-door muscle car, and the 2014 Charger 100th Anniversary Edition celebrates the brand's centennial with uniquely designed appointments to complement the sedan's world-class power, handling, technology and iconic style. Exclusive interior appointments are designed to make the 2014 Dodge Charger 100th Anniversary Edition stand out. Dodge designers were inspired by the rich history of Dodge and sought to outfit the interior with premium attributes that reflect the patina and machinist legacy of John and Horace Dodge. All-new Molten Red or Foundry Black Nappa leather with a custom cloud overprint wraps the sport seats, center console armrest and door armrests. A unique three-spoke flat-bottom performance steering wheel features die-cast paddle shifters for added driver control. For an industrial appearance, leather-wrapped surfaces are sewn together with brass-colored accent stitching. Dark Brushed Graphite center console bezels and Liquid Graphite steering-wheel accents provide a premium look. Interior appointments designed to commemorate the brand's centenary include die-cast "Dodge Est. 1914" circular badges on front seatbacks and an embroidered anniversary logo on premium floor mats. All-new instrument panel cluster graphics feature unique black-face gauges with white indication and stand-out red "100" mph indication for this special occasion. And to play up that this is no ordinary Charger, the Electronic Vehicle Information Center and Uconnect 8.4-inch touchscreen feature a unique startup image, evoking the industrious nature of Detroit. Paired with the award-winning Uconnect 8.4-inch touchscreen is Beats by Dr. Dre audio technology, standard on 2014 Dodge Charger 100th Anniversary Edition models. This segment-exclusive sound experience includes 10-speakers and a 12-channel 552 watt amplifier that integrates Beats proprietary equalizer algorithm, all to create the high-definition sound quality required in professional recording studios. And it wouldn't be a Dodge without world-class performance and efficiency. The Dodge Charger 100th Anniversary Edition based on the 2014 Dodge Charger SXT Plus features the award-winning 300 horsepower 3.6-liter Pentastar V-6 engine with state-of-the-art eight-speed transmission and active intake manifold and sport mode, delivering best-in-class rear-wheel-drive fuel economy, up to 31 mpg, and a 0-60 mph time in the low 6-second range. For customers who demand even more power, the Dodge Charger 100th Anniversary Edition based on the 2014 Dodge Charger R/T Plus adds the more powerful 370 horsepower and 395 lb.-ft. of torque 5.7-liter HEMI V-8 engine with four-cylinder mode Fuel Saver Technology and up to 25 mpg on the highway. All 100th Anniversary Editions include sport mode calibration, performance-tuned suspension and steering-wheel mounted paddle shifters for added driver control. Completing this special model are two unique key fobs, which include a 100th Anniversary Edition jeweled logo on the back side, a customized owner's kit and a special commemorative book celebrating the 100 years of Dodge heritage. Available in limited quantities, the 2014 Dodge Charger 100th Anniversary Edition package is available for a U.S. Manufacturer's Suggested Retail Price (MSRP) of $2,200 more than the SXT Plus or R/T Plus trim levels, offering tremendous value for all of the unique attributes, including 20-inch aluminum wheels, exclusive Foundry Black or Molten Red 'cloud print' heated Nappa leather, flat-bottom steering wheel, rear spoiler, Beats Audio, performance suspension and steering, die-cast paddle shifters and commemorative jewelry. There is no vehicle more iconic than the head-turning Challenger, which serves as the perfect foundation to celebrate 100 years of Dodge style and performance. Based on the 2014 Dodge Challenger SXT Plus and R/T Plus models, the new 100th Anniversary Edition pays tribute to the brand's history in contemporary Dodge style. Similar to the Charger, the Dodge Challenger 100th Anniversary Edition includes all-new 20 x 8-inch polished five-spoke aluminum wheels with Granite Crystal pockets and matching Granite Crystal grille surround with script "Challenger" badge. To provide contrast, Pitch Black, Bright White, Billet Silver, Granite Crystal, Ivory Tri-Coat, Phantom Black Tri-Coat, Header Orange and an exclusive High Octane Red pearl coat paint are available. For added detail, commemorative bar style "Dodge Est. 1914" front-fender badges and Dodge '100' wheel center caps mark this special edition. leather are Liquid Graphite center console bezels, steering wheel accents and door handle pulls. Interior appointments designed to commemorate the brand's centenary include die-cast "Dodge Est. 1914" circular badges on front seatbacks and an embroidered anniversary logo on premium floor mats. For a touch of style, new bright white gauge faces feature a surprising detail element as the "100" mph indication is marked appropriately in red. Adding even more detail is the Uconnect system's startup image, evoking the industrious nature of Detroit. Finishing out the interior is a seven speaker Boston Acoustics audio system with 368-watt amplifier, along with Mopar "Challenger" sill plates and bright pedals. Performance and Challenger are synonymous. The Dodge Challenger 100th Anniversary Edition based on the 2014 Dodge Challenger SXT Plus model features a 305 horsepower 3.6-liter Pentastar V-6 engine, delivering up to 27 mpg on the highway. Available with a six-speed manual or five-speed automatic, the Dodge Challenger 100th Anniversary Edition based on the 2014 Dodge Challenger R/T Plus offers up to 375 horsepower, 25 mpg highway and 0-60 mph under 6 seconds. Both V-6 and V-8 models include sport mode calibration, performance-tuned suspension and three-spoke flat-bottom performance steering-wheel. Available in limited quantities, the 2014 Dodge Challenger 100th Anniversary Edition package is available for a U.S. MSRP of $2,500 more than the Challenger SXT Plus or R/T Plus trim levels, offering tremendous value for all of the unique attributes, including 20-inch aluminum wheels, exclusive Foundry Black or Molten Red 'cloud print' heated Nappa leather, flat-bottom steering wheel, Premium Boston Acoustics audio, performance suspension and steering, die-cast paddle shifters and commemorative jewelry.